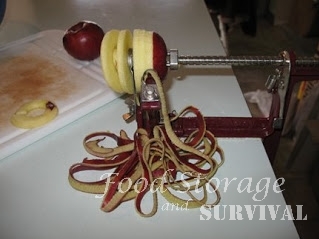 Here’s the apple peeler/corer/slicer I use. It is a Back to Basics brand and clamps to the countertop. I’ve been told you can get a version of this through Pampered Chef as well. When the handle part is pulled back you stick an apple on the prongs with the prongs going into the core from the bottom or the top of the apple with the opposite end aimed toward the coring circle. Then just start turning the handle (kids love this job) and it peels, slices and cores the apple as it goes through the blades. Slick! 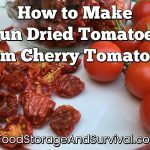 Makes apples for pies, apple crisp, canning, and dehydrating, fast and easy. 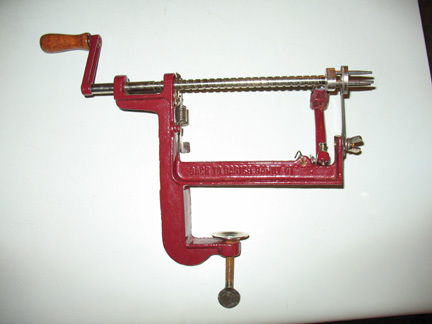 Here’s the corer/slicer/peeler tool in action. My kids love to eat the peelings also! This also makes curly fries if you set the peeling part thicker.